MALLARD DUCK FAMILY WALL SCULPTURE. 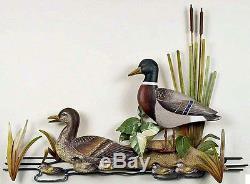 A family of Mallard Ducks pause to rest amidst reeds and cattails in this magnificent mixed media wall sculpture. The Mallary Duck family are carved of wood by master Balinese artisans and hand painted in rich tones and accented with iron waves, waterside plants and cattails. Each sculpture is hand crafted and a unique work of art and may vary slightly. Can be displayed both indoors or outdoors under cover. If you display this sculpture outdoors it must be in a covered area completely protected from the elements. Dimensions: 29" x 22" x 3. All sizes are approximate since each piece is handmade. Currently on BACK ORDER and due to arrive back in stock in MID JANUARY 2017. Your order placed today will reserve one for you. The item "WALL ART MALLARD DUCK FAMILY WALL SCULPTURE LAKE HOUSE DECOR LODGE DECOR" is in sale since Tuesday, November 15, 2016. This item is in the category "Home & Garden\Home Décor\Wall Sculptures". The seller is "kensingtonrowcollection" and is located in Fort Pierce, Florida. This item can be shipped to United States, Canada, United Kingdom, Denmark, Romania, Slovakia, Bulgaria, Czech republic, Finland, Hungary, Latvia, Lithuania, Malta, Estonia, Australia, Greece, Portugal, Cyprus, Slovenia, Japan, Sweden, South Korea, Indonesia, Taiwan, Thailand, Belgium, France, Hong Kong, Ireland, Netherlands, Poland, Spain, Italy, Germany, Austria, Russian federation, Israel, Mexico, New Zealand, Philippines, Singapore, Switzerland, Norway, Saudi arabia, Ukraine, United arab emirates, Qatar, Kuwait, Bahrain, Croatia, Malaysia, Brazil, Chile, Colombia, Costa rica, Dominican republic, Panama, Trinidad and tobago, Guatemala, El salvador, Honduras, Jamaica.